There has been a long tradition in video games of producing challenges which can be reduced to flying around and shooting the crap out of everything you see. 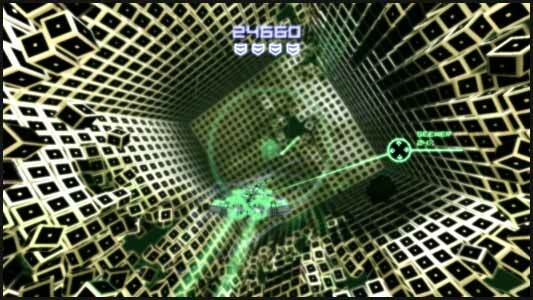 Star Fox, which started out on the SNES, was a good example of what you could do with a wire frame world. Although it was well received and went on to be updated, it remained a traditional linear experience. 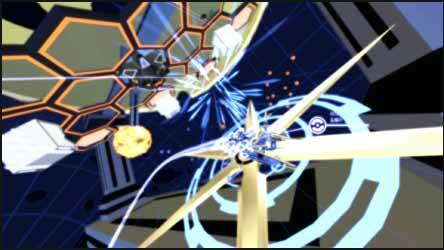 Kromaia Omega plans to change all of this by providing the player with a 360 degree experience. Most of the architecture is Romanesque; you’ll be flying around columns a lot of the time in a ship which is armed with two types of weapons. You have your traditional machine gun type weapon, lots of shots, quick reload, but low impact as well as you secondary weapon which gives more of a punch, but at the expense of reload and number of shots. There is a plot, something about four gods and a trapped/dead being, but even the game treats this as a throw away concept, preferring that you jump straight into the action. 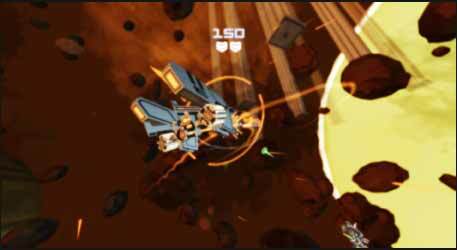 Before this you can choose one of the difficulty levels and there are some rudimentary configuration options, which considering the ship has only two functions (fly straight or roll and you only have two guns), there is not a lot to play with. You can change out your gun set; this creates a slightly different aesthetic but makes little difference in actual game play. So, basically you get to fly around in a 360 arena, where most of what you can see is destructible and it’s worth spending a little time blowing up some of the blocks as they may contain shields or boosts. You normally have an objective, like collect the next twenty pieces for a jump gate, but nothing which is likely to entice you on an emotional level. So, its 360, its puzzles, so what is so good about that? 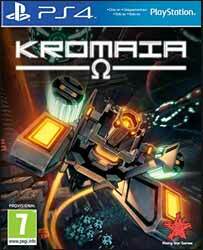 Well, Kromaia Omega provides a fast and fluid shooting game. The AI enemies are in no way a push over and at the high levels prove to be a real challenge. With the myriad bursts of colour and numerous floating objects it can be really easy to lose yourself and find yourself dead. The game does go some way in trying to mitigate the chaos by providing your ship with a directional arrow, which points to your next objective. The only problem with this is that it is on the same plane as the front of the ship so when flying straight and viewed from behind this disappears in front of the ship. You hip also occasionally will point out useful objects in your immediate vicinity, that’s if you can take your eyes off the action long enough to pay attention to it. So it’s shallow of plot, but mad, bright and frantic so will probably end up taking more of your time than you intended.